Fe-Mon-9 is designed to assist in balancing your body’s natural hormonal levels. this powerful exclusive formula contains scientifically-proven, standardized natural herbs, amino acids, together with gamma oryzanol. These nutrients help to relieve menopausal symptoms and offer powerful antioxidant protection. A Natural Method to assist your body’s regulation during the change of life. 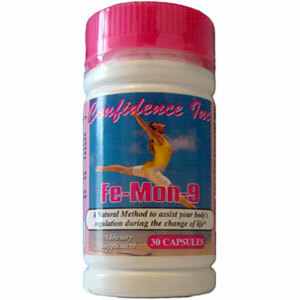 Fe-Mon-9 is designed to assist in balancing your body’s natural hormonal levels. this powerful exclusive formula contains scientifically-proven, standardized natural herbs, amino acids, together with gamma oryzanol – the major antioxidant in rice bran and Lycopene which has been shown to have major protective effects throughout the body. These nutrients help to relieve menopausal symptoms and offer powerful antioxidant protection. Menopausal symptoms including hot flashes, night sweats, mood changes. Take 1 (one) capsule each morning for minimum of 3 (three) months with a light snack. This product should not be used by persons under the age of 21, or any one being treated for a serious medical problem without consulting a physician. Keep tightly closed in a cool dry place at a temperature of 15-30 degrees Celsius (59-86 degrees Fahrenheit) and out of reach of children. Do not use if inner seal or outer neck band are broken.